Another way of saying the same thing is to say that if you want to create superior value for the customer (as perceived through her eyes) you have to focus on both the “Outcome” and the “Experience”. By “Outcome” I simply mean that when a customer interacts with you then she does so because she desires a specific outcome – an end result. By “Experience” I mean the customers subjective experience of her interaction/s with you in the process of getting to her outcome. What is a structure of a perfect service experience? Allow me to share my recent AA breakdown experience as it is a useful guide on what kinds of behaviour work for us as human beings. Last weekend my car failed to start: I tried once, I tried twice, I tried three time and then I simply used the other car. The next day I did the same and gave up – the car simply would not start and I could not figure out why as it had been working perfectly. It is Sunday, I know I need the car for Monday and it just does not start. So I have a problem. My desired outcome: the engine starts and I can use that car to drive around. The job to be done: an engineer to come out, take a look and fix it so that it works and I have my desired outcome. The time had come to call the AA – as I have taken out the home breakdown cover. One of the most infuriating experiences is the experience of needing to contact an organisation and not being able to find the right contact number. A great example of a company that falls into that group is Sky: each month I get a statement and there have been a few times that I have wanted to call Sky to discuss something but there simply is no contact number on the statement! To get that contact number I have to log on to their website and hunt around for that contact number. And when I do get that number I have to figure out which IVR option it is – sometimes I get it wrong. With the AA I had no such problem. I simply took out my membership card turned it over and rang the emergency breakdown number. How much effort did I need to make? In answering this question what matters is my experience (my perception) and in my experience it occurred as no effort at all. We have all heard “we are experiencing unusually high call volumes” no matter when we call accompanied by “your call is important to us”. Does that make you feel better? Do you believe a word of it? Well I am delighted to say that I did not receive any of that rubbish when I rang the emergency number. My call was answered in less than a minute and I remember being surprised at how quickly a friendly human voice was on the other end of the phone. Once I was talking with the customer services agent (the young lady on the line) I simply had to give my membership number (which is written on my membership card) and tell her of my situation. She then simply asked me for the car registration number which I provided. Using that information she identified the make, model and age of the car. This was all done in a couple of minutes – at most. Then she read out the time and told me that someone would be with me within an hour. The way that she said that occurred as deliberate and confident and that inspired confidence / trust in me: this organisation knows what it is doing and someone will be with me within the hour. I responded by saying that as my broken down car was sitting on my drive my need was not urgent and so if the AA had to choose between getting to me and someone broken down on the motorway then I’d be happy for them to take care of the person on the motorway. To my surprise, the young lady on the other line acknowledged my generosity and thanked me for it. That made me feel good! After my call with the AA lady I settled down to do some work on the computer. Before I knew it (because I was immersed in what I was doing) the AA mechanic turned up. I remember being surprised because the response seemed quick: I looked at my watch and it had only been some 35 minutes – the AA patrol man had turned up in half the time that I had been quoted. I handed over my keys to the patrolman (“Andy”) and he got busy trying to start the car. Then he asked me the following question “Did you start the car and then stop the car without really driving it?” I told Andy that indeed I had done that simply to rearrange the car on the drive – to free up parking space for guests. Andy told me that by doing that I had most likely flooded the engine with excess fuel and soaked the spark plugs. After a few attempts Andy got the engine started and told me to let the car run for about 20 minutes. And he advised me how to avoid flooding the engine and thus stop my current problem from happening again. At this point I felt foolish and bad about calling out the AA. My issue was a non-issue: I could have done what Andy had done to get the car started. And I felt foolish that I did not know how easy it is flood the engine in a car like mine. If I had simply carried out a few sensible behaviours I would not have the issue in the first place. So I apologised to Andy for having to call him out for such a simple non-issue. To my surprise he replied that I should not feel bad as it is a common problem. And he finished by saying “We are here to help you!” and the way that he said it (and the way he had interacted with me in fixing the car) occurred as authentic. He was not following a script or mouthing some corporate slogan – he believed what he was saying. I thanked him and he left. In the second part of this post (Part II) I will cover the 11 lessons for crafting the perfect service experience. Maz, I have AAA (Automobile Association of America) here in the US, and I’ve been a member for the past 20+ years, for many of the same reasons you’ve identified in your post. They make excellent use of technology (to know their members, and to expediently deliver their roadside assistance) in order to deliver the outcome you describe. But in addition to a strong and effective use of technology, they are able to “wrap the technology” in genuine human interaction, to deliver the experience we as customers crave. Maz, you call out outcome versus experience. It strikes me that the best outcome would be if you never had to go through the experience. This may sound a little far fetched, but if you log on to NHS direct they have a very good symptom checker that provides advice / reassurance rather than you having to go to see a doctor. I am sure the AA could provide something similar (if they don’t already). Do you think that sort of “mitigation” activity provides for a good experience? The irony for me is that there is a banner ad for Sky broadband right under your blog! Nevertheless in Sky’s (slight) defense I don’t think the contact comparisons are strictly comparable. AA is an emergency service and has to answer the call straight away (that’s the expectation) and IVR options are not needed since you called the breakdown line. By not showing phone numbers on their correspondence I’d guess Sky are signposting you to web self-service in the hope of cutting call volumes and therefore costs. Though I think for their brand and business that’s short sighted and wrong. That kind of trade off in a multichannel world is a common dilemma. If Sky did post a phone number on the correspondence, would the increased cost be more than offset by better engagement, subscribers taking more services and churning less? Intuitively I’d say yes but Sky is in a great position to test both options, if they are not already doing so. It was that memory that came to me when I recently needed breakdown cover for my car that had just come out of its manufacturers cover and I joined the AA, despite being bombarded with offers from the competition. 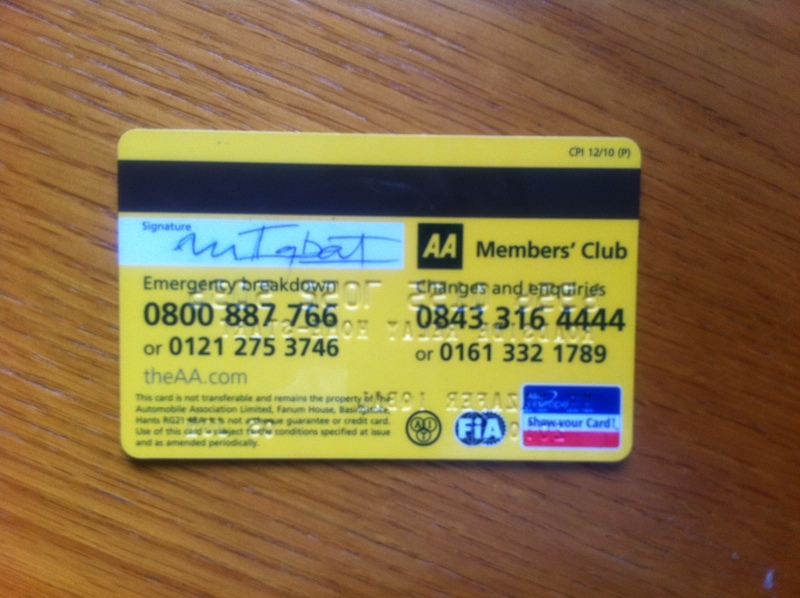 I am always looking for companies that consistently excel in service and maybe the AA is one. Unfortunately someone will; always come up with the story of being stuck on the M4 for 2 hours in the cold and wet……. You make two great points that resonate with me. First, the reason that the AA excels at customer contact and the service experience is because it is the core business! Which implies that for the majority of businesses out there customer interaction when it comes to service is non-core. And that is why they tend to do such a poor job of it. The second point was that about the fact that because you had interacted with the AA, used their service and had been pleased with their service you remembered them when it came time to purchase a breakdown service. So this positive interaction was imprinted on your memory and then acted as the spur for going back to the AA. Now tie that up with all the companies that are doing everything to avoid actually interacting with customers.